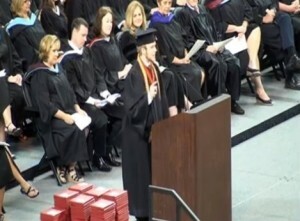 PICKENS COUNTY, S.C. — A high school valedictorian from South Carolina ripped up his approved speech on stage this past weekend, and minutes later, delivered the Lord’s Prayer in defiance of the school district’s decision to no longer include prayer at graduation ceremonies. The crowd again broke into cheers and applause as Costner concluded, and one faculty member sat smiling behind him. Eby said that the district will not be taking any action against Costner. An online video of Costner’s prayer has received over 13,000 hits and more than 300 likes since yesterday.